Flying an airplane is surprisingly easy. At it’s most basic level, straight and level flight, it’s all about learning to move with a third axis, Up and Down. You learn the basics of flying in the first 5 to 10 hours while you prepare for your first solo. After that it’s communications, navigations, and safety, safety, safety. 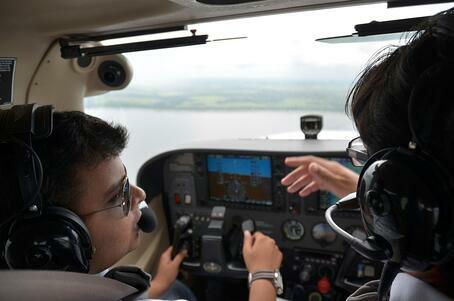 Learning the basics of how to fly an airplane is the first step to becoming a professional pilot. All good pilots started out by learning the basics “stick & rudder” airplane is controlled, as well as the theory behind it. The rudder, the yoke, and radio communications are three basic yet major components of flight. Mastery of these three components will give you a solid foundation for your pilot career. The yoke is the primary control for pitch and roll movements of the aircraft. This control can be turned left or right for roll movement. It can also be pushed forward and pulled backward for pitch movement. Turning the control left and right moves the ailerons of the aircraft. The ailerons are surfaces located on the backside of the wing towards the tip. When using the ailerons for roll movements, one aileron will go up and the other one will go down. This affects the flow of air over the wing. The aileron that moves up or down depends on which way you are turning. If you turn the yoke to the left, the left aileron will move up while the right one moves down. The forward and backward movement of the yoke allows for the nose of the aircraft to pitch up or down. Pushing the yoke forward will cause the aircraft to aim down and pulling the yoke backward will cause the nose to pitch up. These movements are used mainly when climbing or descending. When taking off you will pull the yoke backwards in order to pull the nose up. This increases the flow of air under the wing creating lift. The rudder pedals are arguably the most important controls on an airplane. The pedals control the rudder which allow the aircraft to yaw in the air. This control surface provides stability, allows for controlled turns, and allows you to line yourself up with the runway when landing, among other things. The rudder pedals also control the nose wheel and brakes when the aircraft is on the ground. The brakes are applied by putting pressure at the top of the rudder pedal. The nose wheel is controlled by pushing either pedal in the direction you would like to go. Rudder control is extremely important in flight. Without this control input, the aircraft would not fly as effectively as it should. 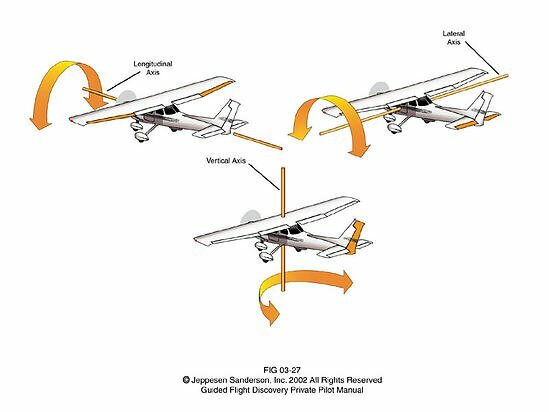 It is imperative that new students grasp the importance of rudder control, as this is sometimes overlooked when first learning how to fly an airplane. Rudder, rudder, rudder! Communications is a vital part of learning how to fly an airplane. The ability to talk to others allows for a much safer flying environment for pilots as well as those on the ground. Without radio communications airport and airspace could not safely exist. Even the smallest uncontrolled airport relies on communications for coordination and collision avoidance. Pilots must talk to each other as well as aircraft control towers when necessary. It can be scary at first, especially if English is not your first language. The best way to become proficient at communications is to practice! Do not hesitate to get on the radios to talk to pilots or the tower. The components discussed above merely scratch the surface when it comes to flying but with this basic knowledge you are well on your way to fulfilling your dream of flying. Excellent rudder and yoke control will help you tremendously when training. Pairing that with excellent communications will keep you safe and get you far in your commercial pilot career. Becoming a pilot is one of the most fulfilling things you will ever do but learning the basics of flying airplanes is just the beginning!